Combine an eclectic fusion of electronic, jazz and house with some edgy tribal sounds, add a few quirky toys and a looping machine – and you have LegoLoop. This Italian Inditronica duo – Francesca Krnjak and Riccardo Moretti – are pushing the boundaries of the avant guarde muso-artiste! This is an act that simply must be seen, LIVE. Franscesca’s otherworldly sensuality and syrupy voice combined with Riccardo’s high energy percussion and mixing, make them a potent duo of performance, poetry and passion. LegoLoop is a tour-de-force on the music scene. Bold, imaginative and quirky – these are performers of the highest order. 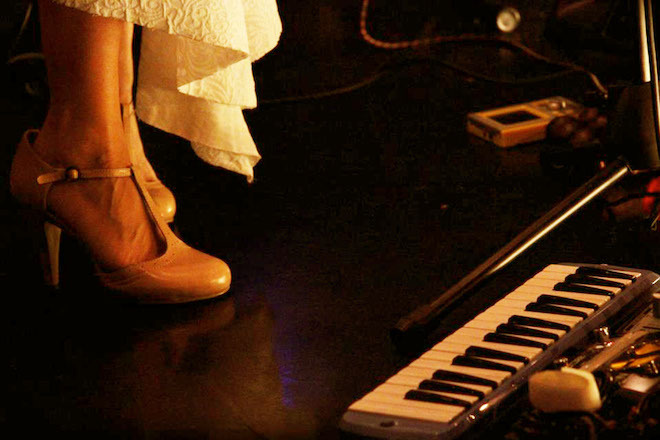 Step onto their musical carpet ride and you’ll be transported to a world of new sights and sounds. With his experimental combination of Synths, Didjeridoo, Percussion, Hang, Beatboxing and a Loop Station, Riccardo Moretti’s solo project ‘TribalNeed’ is at the forefront of progressive musicianship. Sharp melodies, melancholic sounds and ancient rhythms tell the story of the ‘Electro Nomad’ and his journey between the European Electro scene and Afro-Australian tribal grooves. This mix of organic instruments and circuit bent toys manifests an original approach to electronic music.